Autograph album with inscriptions from 1887 to 1890 that belonged to Harriet E. Phillips, "Hattie", of Oakland County, Michigan. 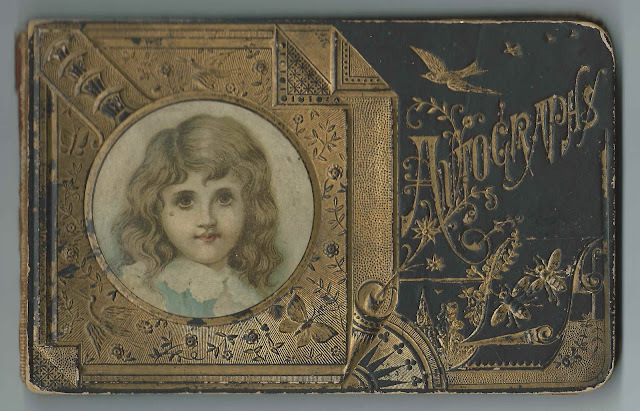 The album was given to Hattie by her cousin Polly at Christmas in 1887. 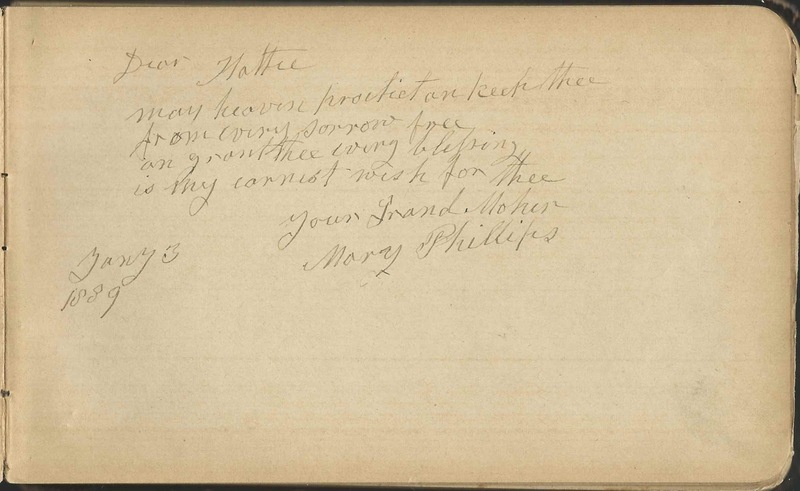 Additionally, several inscribers gave residences of Florida and Wilton, but did not mention a state. I assume that these were villages in Michigan, but perhaps a reader will have more insight. 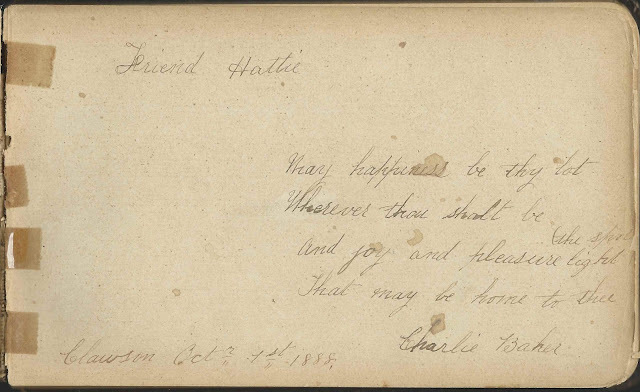 The album measures approximately 7-3/4" by 5" and contains the sentiments of 22 of Hattie's relatives and friends. An alphabetical list of the inscribers, together with any personal information they offered, appears at the end of this post.
? - one of whom was "Cousin Polly"
Walker  - cousins and "Uncle Net"
According to her death record, Harriet E. Phillips, "Hattie", was born March 28, 1872 at White Lake, Michigan, the daughter of Eli Phillips and Julia (Perkins) Phillips. Hattie's paternal grandmother, Mary (Mogford) Phillips, inscribed a page in the album on January 3, 1889. On April 2, 1891 at Pontiac, Michigan, Hattie E. Phillips married Charles Baker, son of George Baker and Harriet (Long) Baker, who had immigrated to the United States from England. Charles inscribed a page in Hattie's album on October 1, 1888 at Clawson, Michigan. 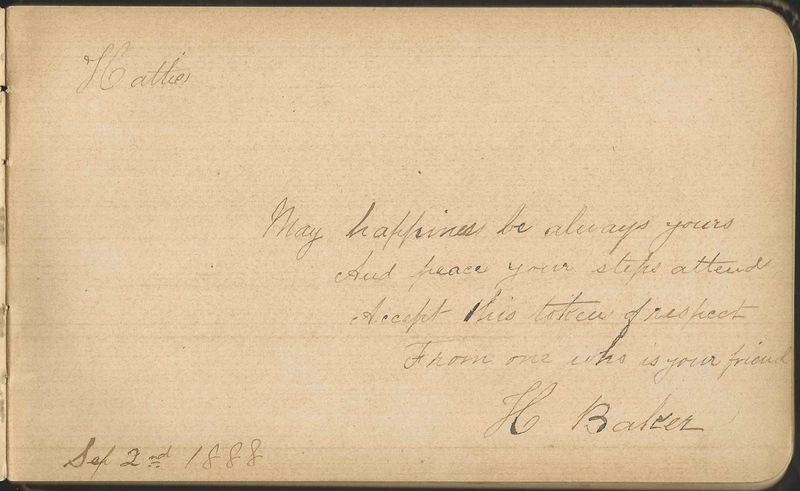 Charles' sisters inscribed pages, and the H. Baker who inscribed a page may have been Charles' mother Harriet (Long) Baker. Hattie died at Royal Oak, Michigan, on March 17, 1947; Charles died in 1949 at Clawson, Michigan. They're buried in the Crooks Road Cemetery at Troy, Michigan. 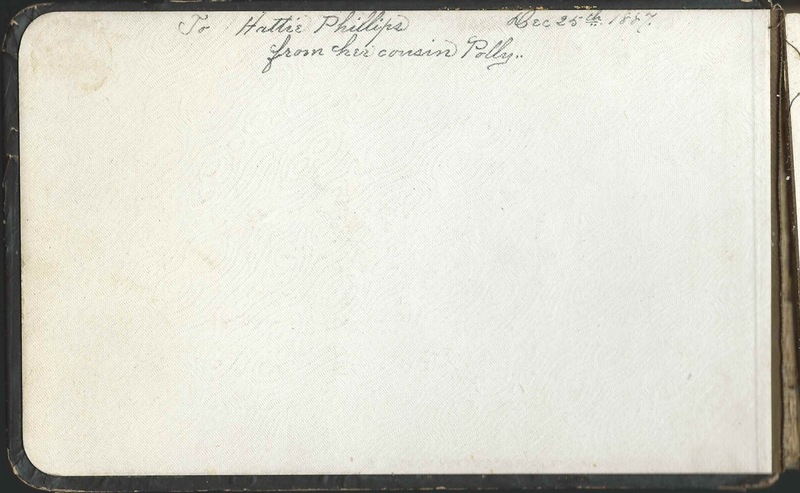 Polly; inscribed at Clawson, Michigan, on December 25, 1887. She was Hattie's cousin and the person who gifted the album to Hattie. 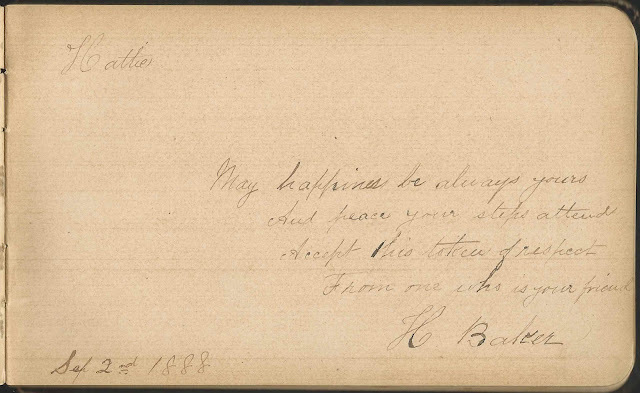 Charlie Baker; inscribed at Clawson, Michigan, on October 1, 1888. Presumably Hattie's future husband Charles Baker. Maurice R. Blair; inscribed at Clawson, Michigan, on March 12, 1890. His wife Nellie (Allen) Blair, whom he married on March 12, 1882, inscribed the right facing page. Nellie Blair of Clawson, Michigan; inscribed on March 12, 1890. She was Nellie (Allen) Blair, whose husband Maurice R. Blair, whom she married on March 12, 1882, inscribed the left facing page. Rosetta Kyser, or Rosetta Keyser, of Burnham, Michigan; inscribed on October 2, 1888. The town is shown as B-ham, so I'm guessing it's the former settlement of Burnham at Arcadia, Michigan. Net Walker; inscribed at Wilton, no state written, on January 5, 1888. Hattie's uncle.